Hotel Centrale Amalfi - Video Tour - Cheap and friendly 3 star hotel ideal for a trip to the Amalfi Coast! 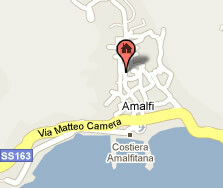 Hotel Centrale Amalfi offers you inexpensive accommodation in the heart of one of Italy’s most famous coastal towns. Get a first hand impression with our new Video Tour by simply clicking the Play button below! Also check out our interactive Virtual Tours.